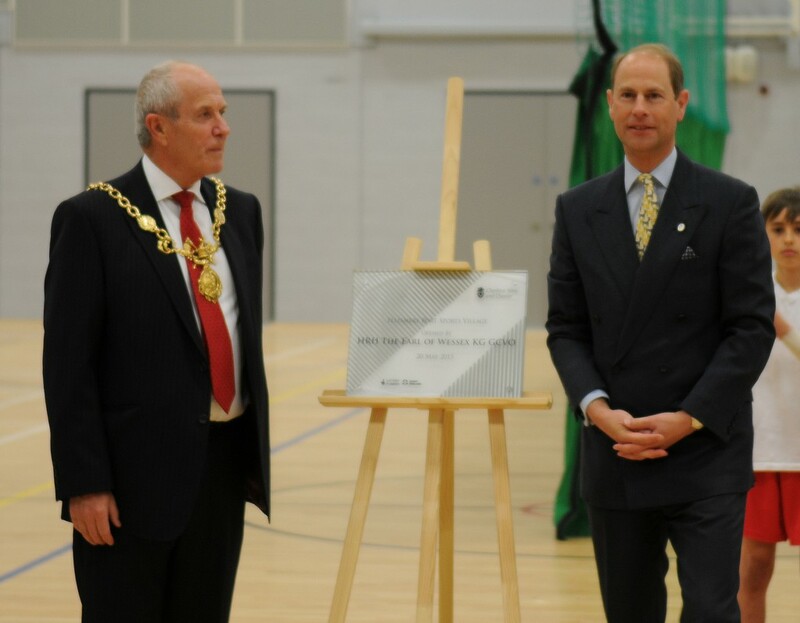 His Royal Highness, the Earl of Wessex has today (Wednesday) officially opened Ellesmere Port’s iconic Sports Village during a special visit to the borough. The Earl was received by Lord Lieutenant of Cheshire, David Briggs, and Chairman of the Council, Bob Rudd, before meeting other dignitaries including the High Sheriff of Cheshire, Bill Holroyd, Robbie Johnston, The Duke of Edinburgh Award Director, North West, and a group of Duke of Edinburgh students – a scheme of which HRH is the UK trustee. The Earl was taken on a tour by the building’s Brio manager Kerry Graham and introduced to current Commonwealth Super-Flyweight champion and Ellesmere Port resident Paul Butler, also an undefeated Bantamweight Champion, who has boxed for his country in over 30 matches and is currently fighting in the super-flyweight category. After viewing the state-of-the-art fitness studios and 80-station gym, HRH was escorted by the Chairman to meet with representatives from Sport England, the Ellesmere Port Development Board, Cheshire FA, Active Leisure and the Council’s contractor for the build, Wates Construction. 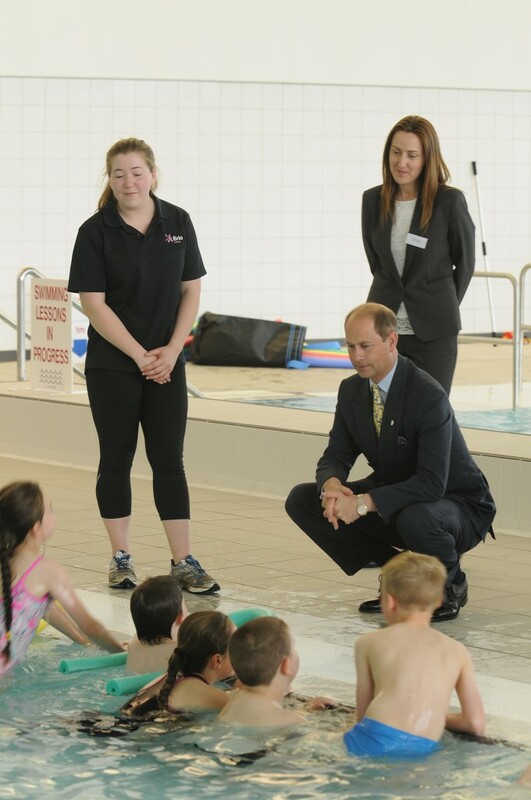 Local pupils from William Stockton and Cambridge Road Primary Schools and Brio representatives greeted Prince Edward at the eight-lane competition swimming pool where he chatted to children after enjoying a swimming display. Whilst touring the building The Earl heard how the construction of the new facility has benefitted local residents, with 40 percent of the workforce being recruited locally and successful work placements including a trainee engineer and a trainee site manager leading to permanent offers of employment with Wates Construction. Long term training and trade apprenticeship placements have also been available in a range of different roles. In the facility’s sports hall, which features an eight-court badminton hall with a seating capacity of 1400 – soon to become home to the Cheshire Phoenix basketball team – the club displayed their Hoops 4 Health community programme with primary school pupils. Hoops 4 Health is the British Basketball League’s national scheme combining basketball coaching with practical healthy living advice including the importance of keeping physically active and eating right for young people aged between 8 and 11. A Patron of the British Paralympic Association (BPA), The Earl then met local Para Sports coach and volunteer for the Ellesmere Port, Chester and Neston Special Olympics, Marjorie Rainford and some of the young people she works with. Playing skill and memory games involving tactical thinking with young people with learning difficulties aged from 8 years upwards, the group train in football, netball, table tennis, Boccia and tenpin bowling. HRH then officially opened Ellesmere Port’s iconic sports village by unveiling a special plaque. Cheshire West and Chester Council’s Head of Places Strategy, Alison Knight, said: “We were incredibly proud and honoured to have His Royal Highness, The Earl of Wessex, officially open Ellesmere Port’s iconic new leisure facility today. Future expansion of Ellesmere Port’s Sports Village will provide a new 3G all-weather pitch due for completion this summer, which will complement the competition athletics track already in situ at the site. The building will have the capacity to host regional and televised events. 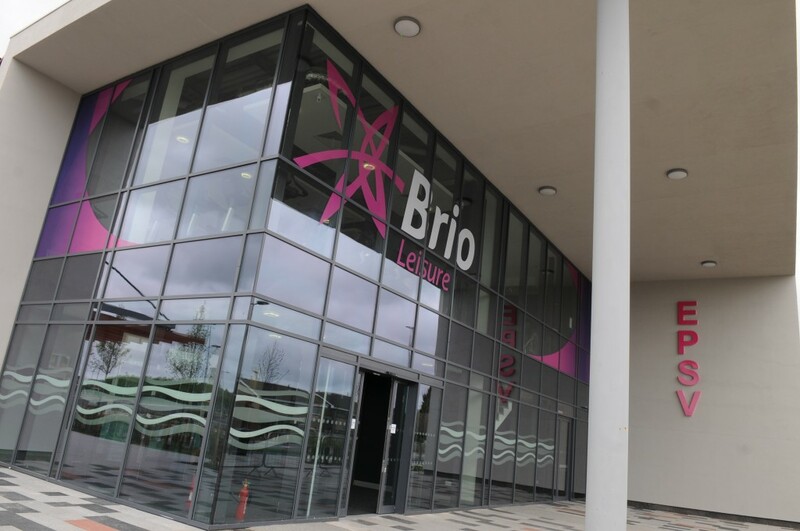 The ambitious £15m project, which has been funded by Cheshire West and Chester Council, with £1 million of National Lottery funding from Sport England’s Iconic Facilities legacy fund, will officially open to the public on Tuesday, May 26 2015.